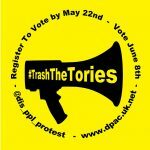 As the GE2017 reaches its final week come DPAC invites you to join us to launch the final chapter in our #TrashTheTories election campaign. While the mainstream media keeps the focus on Brexit and the economy, Deaf and Disabled people have taken to the streets and to social media to tell the public why this election matters so much to us and what the consequences of another five years of Tory misrule will be. On Monday, 5 June, DPAC will be go live on social media with a set of short films generously produced for us by media production company Tough and Rumble aiming to expose the human cost of cuts and the reality behind the Tory narrative of welfare reform. Join us this Sunday for a preview of the films followed by a Q and A and discussion. Light refreshments will be provided. For other access requests or any questions please text Ellen on 07505144371.